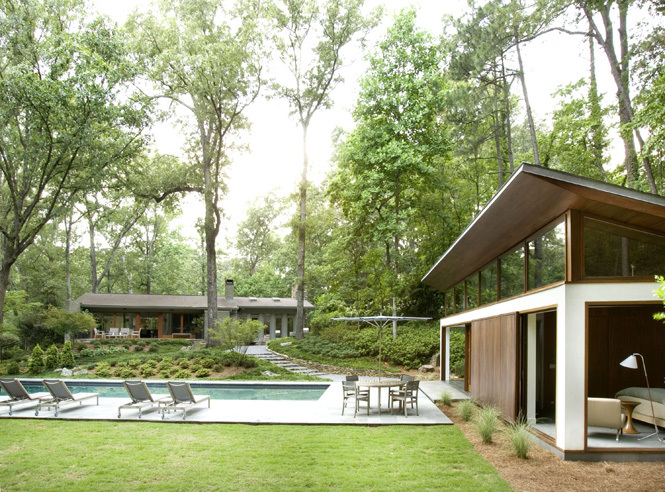 The Nancy Creek Pool & Guest House are additions to an existing 1958 modern home in one of Atlanta’s leafy residential communities. As is typical of the area, the two acre property on Nancy Creek Road is sloped and heavily wooded. Soon after purchasing the property in 2004, the new owners decided to replace a deteriorated tennis court, located just behind the house, with more useful amenities. The new amenities were to include a swimming pool, long enough for swimming laps, a stone terrace, large enough for entertaining, a lawn, big enough for playing ball and a pool house with living space, kitchen, bathroom and guest room. Within the confines of the original tennis court, each design element is positioned to enhance its relationship to the existing house and to the movement of the sun. The pool is located along the western edge to avoid morning shadows from the nearby trees. 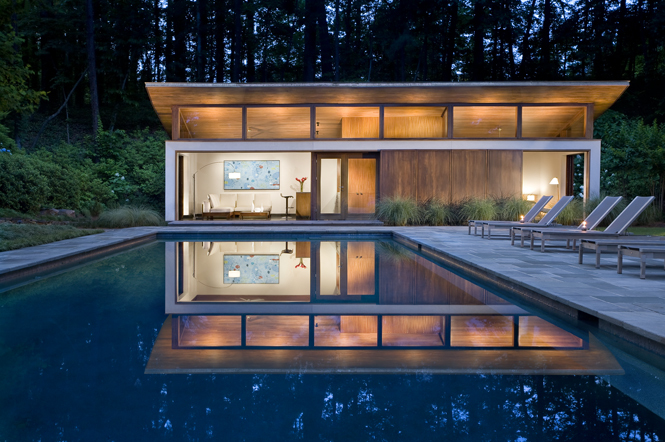 The pool house, located along the northern edge, casts no shadows as it provides a backdrop to the pool and terrace. The stone terrace, encompassing the pool, is wider along the eastern and northern sides to accommodate views to the main house and to create an entry area to the pool house living space. A twenty-four feet wide swath of lawn flanks the pool deck’s southern and eastern sides. The pool house is designed to provide protected living and entertainment spaces adjacent to the pool and to accommodate overnight guests. 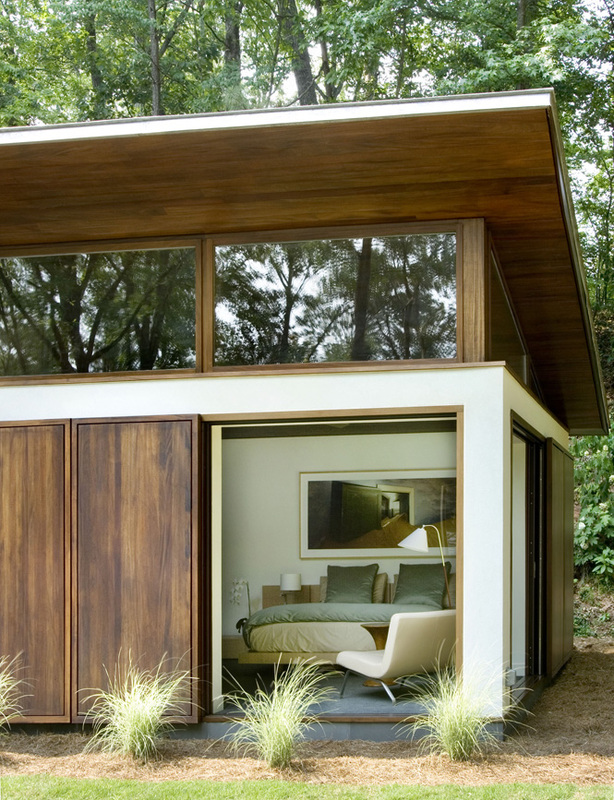 The living space is oriented to the pool and the guest room is oriented to the lawn and woodlands. 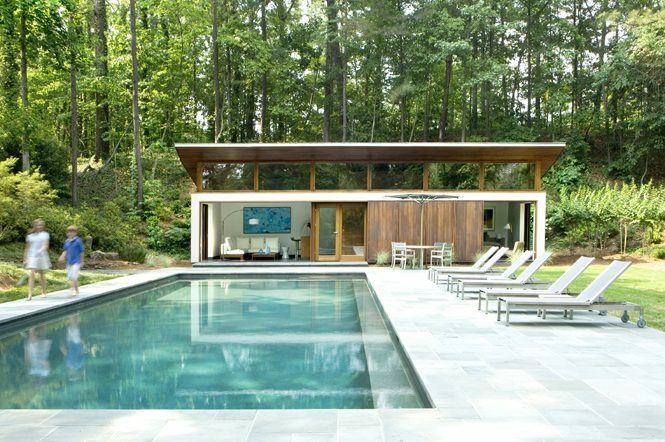 To maximize its relationship to the pool and to the surrounding site, the pool house incorporates a lift and slide glazed door system along its three principal elevations. 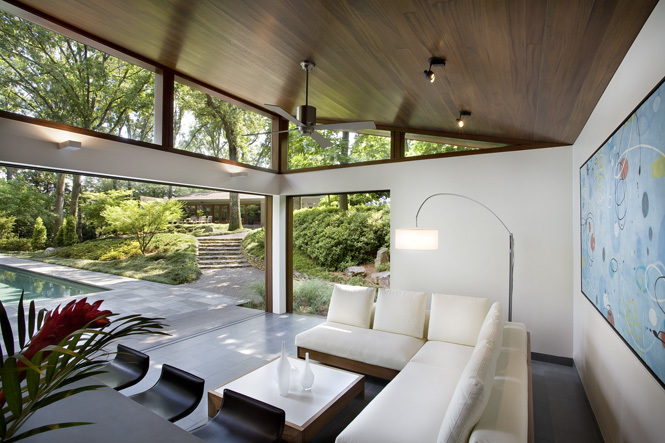 When opened, the sliding doors disappear behind wood wall panels, effectively creating an open-air pavilion.The open pavilion theme is further enhanced by the roof design. 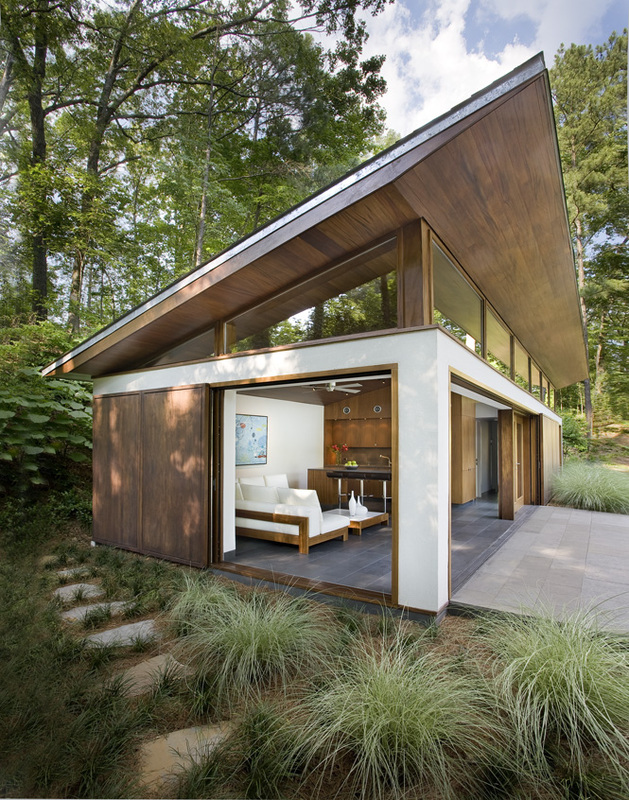 Rising to the south, the sloping roof and its wood ceiling incorporate a tapered four-foot overhang which shadows a continuous band of clerestory windows across the south elevation. Inside, the open pavilion theme is apparent in the living and bedroom areas. 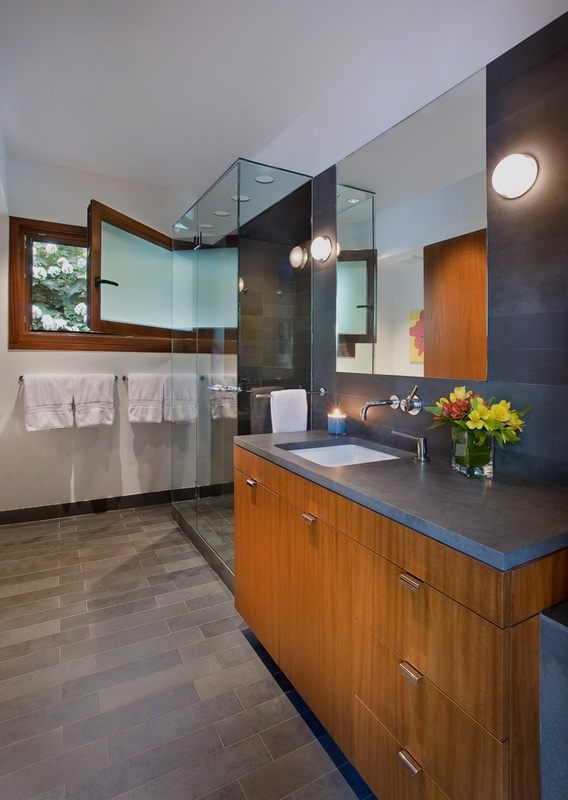 A wood paneled “box”, containing the bathroom and storage elements, separates the two living areas.